I will give to you and to your seed after you, the land wherein you are a stranger, all the land of Canaan, for an everlasting possession; and I will be their God - Genesis 17:8. Behold, I will make you fruitful, and multiply you, and I will make of you a multitude of people; and will give this land to your seed after you for an everlasting possession - Genesis 48:4. Though the definite origins of the word "Palestine" have been debated for years and are still not known for sure, the name is believed to be derived from the Egyptian and Hebrew word peleshet. Roughly translated to mean "rolling" or "migratory," the term was used to describe the inhabitants of the land to the northeast of Egypt - the Philistines. The Philistines were an Aegean people - more closely related to the Greeks and with no connection ethnically, linguistically or historically with Arabia - who conquered in the 12th Century BC the Mediterranean coastal plain that is now Israel and Gaza. A derivative of the name "Palestine" first appears in Greek literature in the 5th Century BC when the historian Herodotus called the area "Palaistine" (Greek - Î Î±Î»Î±Î¹ÏÏÎ¯Î½Î·). In the 2nd century A.D., the Romans crushed the revolt of Shimon Bar Kokhba (132 CE), during which Jerusalem and Judea were regained and the area of Judea was renamed Palaestina in an attempt to minimize Jewish identification with the land of Israel. Under the Ottoman Empire (1517- 1917), the term Palestine was used as a general term to describe the land south of Syria; it was not an official designation. In fact, many Ottomans and Arabs who lived in Palestine during this time period referred to the area as "Southern Syria" and not as "Palestine." Leading up to Israel's independence in 1948, it was common for the international press to label Jews, not Arabs, living in the mandate as Palestinians. It was not until years after Israeli independence that the Arabs living in the West Bank and Gaza Strip were called Palestinians. In fact, Arabs cannot even correctly pronounce the word Palestine in their native tongue, referring to [the] area rather as "Filastin." The name "Palestine" has been highjacked by the Palestinian Liberation Organisation (PLO), which was established in Jordon in May 1964. .... as the "sole legitimate representative of the Palestinian people" by the United Nations and over 100 states with which it holds diplomatic relations, and has enjoyed observer status at the United Nations since 1974. The PLO was considered by the United States and Israel to be a terrorist organization until the Madrid Conference in 1991. In 1993, [the] PLO recognized Israel's right to exist in peace, accepted UN Security Council resolutions 242 and 338, and rejected "violence and terrorism"; in response, Israel officially recognized the PLO as the representative of the Palestinian people. that those presently laying claim to it, do so by right of prior inheritance. I am reminded of a joke about the previous Israeli Prime Minister meeting with the late Yasser Arafat to discuss the ownership of the land. The Israeli Prime Minister began with a story of how the Israelites complained about the disappearance of their clothes after swimming in the waters "created" by Moses after he struck the rock. "It's those Palestinians up to their usual tricks. They've stolen our clothes when our backs were turned." "Now wait a minute" chimed in the PLO leader, "the Palestinians were NOT around at that time." "Well, now that we've settled that, let's begin our talks." Palestine is a borrowed term of convenience to create lies. The Middle East like most parts of the world suffered warfare resulting in dispossession and dispersal, throughout history. In 1948 Israel regained what was part of her rightful possession, which was rightfully extended in 1967. It is all part and parcel of the above prophecies to Abraham (Genesis 17:8) and to Jacob (Genesis 48:4). The land is the rightful inheritance of the descendants of Abraham, Isaac and Jacob as an EVERLASTING bequest by God Almighty who owns the whole earth and can assign it as He determines. He made a promise and in the final analysis He will keep it. It is impossible that the promises relating to âthe landâ can in any way be transferred to Christ or to the Church. 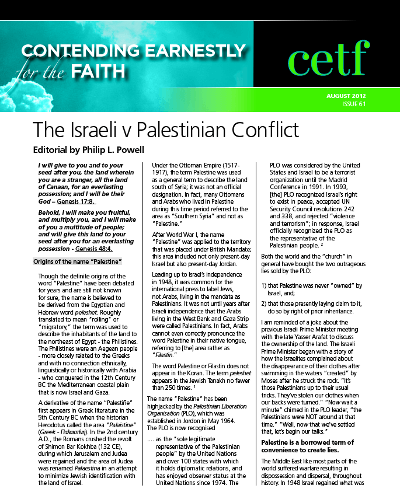 For this reason Replacement Theology is absurd as the main guest speaker at our Conference has ably proven in his long article about his encounter at the ecumenical Church gatherings in Bethlehem earlier this year and previously, when he caused a sensation by accusing those gathered of anti - Semitism - see pages 3 to 33 herein. The Church at Christâs Checkpoint. Behold, I will make Jerusalem a cup of trembling unto all the people round about, when they shall be in the siege both against Judah and against Jerusalem - Zechariah 12:2. The world cannot and never will be âredeemedâ. Only people can be redeemed, individually as they personally surrender to Christ. When that happens, those people become part of âthe company of the redeemedâ âthe Church of Jesus Christ. Itâs a sad state when the so called âchurchâ joins the ranks of the enemy and supports those who deny the promises of God and the truth of His Word. This is the issue we plan to confront in the forthcoming Conference in Brisbane in September and we invite you to join us. Please do your utmost to be with us. IT IS IMPORTANT â possibly the most important Conference CWM has ever conducted. We are ALL standing at âChristâs Checkpointâ on many issues, including the use of our time. With this in mind we have dedicated this particular issue of CETF to publicising the Conference with its speakers and theme. Please see also the end of this magazine, pages 38 to 40 â especially page 39 which details a special accommodation arrangement in Brisbane Gateway Resort which is close to the CWMFellowship property. You can obtain a 20% discount by inserting the code âCWMCONFâ when you make your booking on-line. While a major thrust of the Conference will be the Israeli v Palestinian issue with two notable speakers focussing on Bible prophecy in respect of the End Times, it will not be the only emphasis. Christ is checking His people out in respect of TRUTH - thatâs my topic at the first meeting; EVANGELISM â thatâs the topic Lionel Letcher will address; LEARNING & TEACHING â Lawrie Cornish; WORSHIP & WITNESS â Mark Mullins; GETTING TO & CROSSING THE FINISHING LINE â Bob Bailey. I am excited and trust that a whole bunch of excited people will join the Conference. Feel free to photocopy the publicity material and pass it around. Alternatively we will gladly mail extra copies of this CETF to you upon request. At this stage thereâs plenty of room for more bookings.